Echo and narcissus, नार्सीसस. Echo and Narcissus, द्वारा Nicolas Poussin. c.1627-28. Oil on canvas. Louvre, Paris, France. HD Wallpaper and background images in the ग्रीक पौराणिक कथाओं club tagged: greek mythology echo narcissus. hows that echo and narcissus? 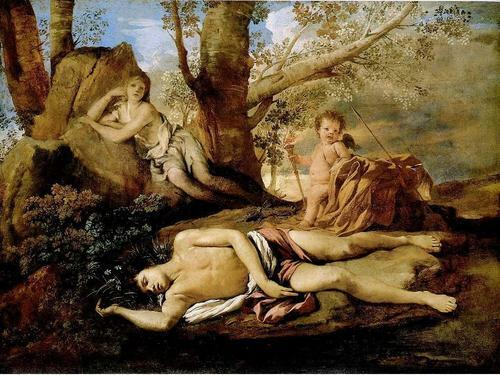 Echo was a nymph who was as obsessed with Narcissus as he was with himself. He is sleeping by the water, where he used to stare at his reflection. Echo is being a complete stalker in the background. No idea what the naked cherub with a torch is though. It's possibly Cupid. God of the Sun: Helios या Apollo?